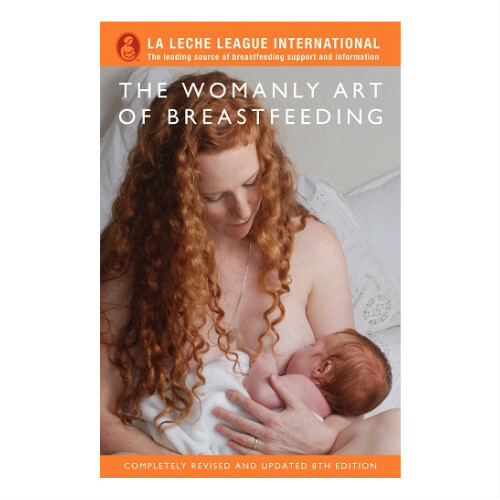 The Womanly Art of Breastfeeding (8th Edition). There’s no getting away from it. The title is slightly weird – and not very accurate. The Womanly Art… was first written in the late 1950s, when that kind of branding was probably what all the groovy Mums thought was brilliant as they came home late from a night dancing a the milk bar. Or something. The first edition was written on typewriters by the founders of La Leche League – a worldwide support organisation famed for breastfeeding and parenting advice, and a name no-one can pronounce (it’s La lay-chay. Apparently). The book has gone through numerous incarnations since then and the 8th edition is bang up-to-date. It talks about how to juggle feeding a baby with your iPad (not literally) and the dilemmas faced by women who need to return to work soon after birth. It also talks about techniques for bottle feeding and how partners can successfully support feeding, even if they don’t lactate themselves. It will, however, be easy to find should you be stumbling around in the dark, groping for a newborn in the early hours whilst trying not to stub your toe on any unattended sharp objects. The first part of the book is an introduction to breastfeeding, with information on things you can do to prepare when pregnant; what you might consider when giving birth to give you an improved chance of getting the baby to latch; and then a section on the first few days after the baby is born. The book then goes on to have a chapter on each stage of feeding, divided into weeks (so you get the first few days, the first few weeks, the next few months, feeding after a year and so on). Towards the back, there are sections on problems you may encounter, with some suggestions on what to try to fix them. There are also ‘tear sheets’ at the back for when you need a quick reminder (e.g. baby crying and you don’t have time to rifle through the index). Throughout the book, the emphasis is on the importance of building your support network – not just so you can feed a baby, but so you can feel part of a community. The book is still produced by La Leche League, who also run support groups and helplines, so it’s not surprising that the authors think that sharing experience with other families is key to feeling good about your feeding choices. The book’s tone is incredibly friendly. Like, really. It feels as though some of your most approachable-but-cool friends are sitting opposite you, mugs of tea in hand, offering virtual biscuits as they support you through whatever is happening. There is a wealth of knowledge, here. It would be a brilliant book to read cover-to-cover when pregnant, but the chapters also mean that you can dip in and out to sections as you need. I liked the fact that it wasn’t all about breastfeeding – the book recognises that sometimes women and babies have problems, and offers techniques if supplementation is required. For example, it shows you how to make a Supplemental Nursing System (SNS), which is a way to feed a baby expressed or formula milk but still allowing him/her to feed from your breast. It also talks about techniques for using a bottle which give maximum cuddling time for you and the baby (always nice) and allow those feeding to be able to spot when the baby has had enough. It also has a good dose of humour woven through. There’s advice on how to deal with the ‘Aunt Frannies’ in your life, and the section on ‘The average diet of a Toddler’ had me snorting out loud (a lot of carpet lint appears to be involved). The book is focussed on the American medical system, and mentions procedures and hospital routines which may not be relevant to those giving birth in other countries. It’s very enthusiastic about breastfeeding. You will probably either find this infectious and supportive, or a bit irritating. The first couple of chapters are probably the most zealous, and then it settles down. There are also some suggestions (e.g. about co-sleeping) which may differ from the official national health advice in your country. As always, you are a grown-up and it’s up to you to make your own choices – the book will offer some suggestions but it’s down to the individual to do what’s right for their own family circumstances. This book gives a fabulous introduction to all the issues but can’t replace in-person, expert support tailored to your own circumstances. See the Help! section for contacts for Breastfeeding/feeding support if you need it in more detail. This book is not about breastfeeding; it’s about parenting. I would put this on my own list of books to buy for a close friend who is pregnant. I came away from reading it with a warm glow of positivity about my own ability to be a parent. It’s already become one of my favourite birth-related books. Just make sure you get the most up-to-date edition! You can buy a copy of The Womanly Art of Breastfeeding (8th edition) here (£) or through this link instead. (£) means that I will get a small fee if you buy something through this link. You can use the plain link if you prefer. It doesn’t affect what I think of you… or the book. Got any other breastfeeding / feeding support books to recommend? Please let me know in the comments below! What would you want for your friend? 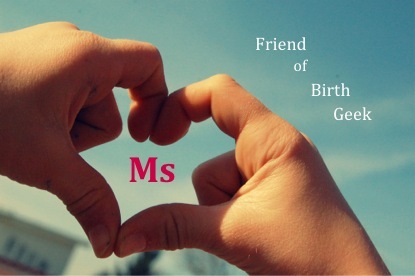 As the Ms Pregnant mini-series draws to a close (for now), I’ve been reflecting on the most important ‘Ms’ of all – any friend of Birth Geek. Psychologists are going to have a field day with this one. Wanting to shape what someone else does? No! That’s bad! You shouldn’t want to change other people! to make her own decisions. with loving care around her, or next door, or there virtually as she pleases. as a tool in her decision-making toolbox. and takes the space to trust its wisdom. because that shows she has the self-esteem to be confident in her choices. Excited! She has no fear and is looking forward to giving birth and the years afterwards. because they had the support and trust they needed to feel ownership of any twists and turns on the way. so that experiences are not held in, a family is appreciated and that Ms Friend of Birth Geek’s triumphs are shared with others to inspire and inform their own journeys. Soups brought round, a listening ear, arms to hug the baby and their parents, acknowledgement from friends and the community that a transition has taken place… or being left in peace, as they prefer. even if it’s just a random lady off the internet. *And also how much more fun would it be for the Midwife to be in a tent halfway up a mountain, or in a suite at the Ritz? **This is not against Unassisted Birth for those who make that choice (see point one). I wish for everyone, no matter where they are in the world, to have access to trustworthy, skilled medical back up if they wish to use it. For too many families, this is currently not even an option. Thanks to Irina Patrascu for the background image. What do you wish for for your friends’ births (even if they are friends you have not yet met)? Please let me know in the comments below. Over the last few weeks, I’ve been having some fun with some pregnant ‘characters’. Ms Average, Ms Standard, Ms Evidence-Based and Ms Cavewoman have all given birth in their own ways. Our Ms Pregnant characters all had similar characteristics. They were all ‘low-risk’, having their second baby, and receiving their care in the UK. Ms Average was an example of the most popular birth choices. Ms Standard had the default care offered on the NHS. Ms Evidence-Based made choices based on academic research. Ms Cavewoman did what came naturally with no other backup or information. They were all fictional …and some of the details of their lives were more made up than others (read: sometimes I filled in the blanks or made creative connections to tell a story. So these articles are in the ‘just for fun’ category. Hold off on awarding me that Doctorate…). Ms Average and Ms Standard gave birth in a hospital. Ms Evidence-Based and Ms Cavewomen gave birth at home (or at cave). Everyone except Ms Cavewoman had a Midwife with them. Ms Evidence-Based had a Doula, and Ms Cavewoman had a friend who acted like a Doula. All the characters also had their husbands with them (although Ms Cavewoman’s was outside). Ms Average used ‘Gas and air’ and breathing exercises. Ms Standard used ‘Gas and air’ and water when she fancied it. Ms Cavewoman didn’t feel the need to relieve any pain. Ms Average gave birth on her back. Ms Standard and Ms Evidence-Based found a position which was comfortable (but not lying down). Ms Standard had an injection in her thigh and the baby’s cord was clamped very quickly after birth. Ms Evidence-Based and Ms Cavewoman gave birth to the placenta naturally. Ms Average started to breastfeed but switched to formula by the time her baby was six weeks old. Ms Standard was encouraged to breastfeed. Ms Evidence-Based and Ms Cavewoman breastfed. My overall interpretation from all of these characters is that many women in the UK are not having an evidence-based birth. And the birth which is evidence-based is nearer the experience of Ms Cavewoman’s than Ms Standard (Ms Standard represents care which follows the NICE Guidelines). It’s also interesting that whilst Ms Average gives birth in hospital, she’s not necessarily getting the care recommended to Ms Standard. For example, if Ms Standard is encouraged to give birth in a position which is not lying down (and this is also what happens for Ms Evidence-Based and Ms Cavewoman), why are most women in the UK giving birth on their backs and in bed? And if the evidence shows that cutting and clamping the baby’s cord immediately after birth is not as beneficial as waiting until later, why do the NICE guidelines still recommend that it is done straight away? And why do most low-risk second time mothers not give birth at home, even though the latest study shows that it has the best outcomes for mother and baby? Answers on a postcard. Or better, a comment on the blog! 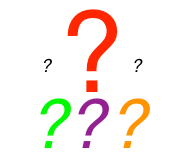 What one thing has surprised you most from the Ms Pregnant series? Please list it in the comments below, and explain what changes (if any) you’d like to see to the care offered instead. I’m forever reading about mythical cavewomen. It’s an analogy often use in birth-related stuff. ‘What would a cavewoman do?’ ‘Use your animal brain,’ ‘Find your inner monkey,’ and so on. Ms Cavewoman has no idea how old she is, because measuring time isn’t that accurate. She’s several seasons old, however. She’s expecting her second cavebaby. Ms Cavewoman has grown up seeing other women give birth and feed babies. She’s not read any pregnancy books, as books haven’t been invented yet. And she’s managed to avoid One Born Every Minute, even though it’s on every cave wall in the country. She hears stories round the fire from her cavewomen friends about how their own children were born. She’s watched other women give birth, too, in her time. When she goes into labour, Ms Cavewoman wants to make sure she’s not going to be bothered by any sabre-toothed tigers. They are considered a great inconvenience when giving birth. She goes into her nice warm, dark cave, and puts Mr Caveman at the door to defend it. Her friend pops over to be with her and they talk softly and plait each other’s hair as she has some contractions. As Ms Cavewoman is not at all frightened of labour, she gets into whatever position seems most comfortable and makes noises to suit her mood. When she can feel that the baby wants to be born, she shifts into a squatting position and gives birth to the baby very easily. She kisses, rubs and licks her baby to help him begin to breathe. Once ‘Desmond’ is born (I have no idea why he’s called that; he just is), she lies back on a pile of animal skins and wraps up as he begins to feed. The placenta comes a little while after and it remains attached until it falls off a few days later. After a bit of a sleep, Ms Cavewoman wraps Desmond up in one of the skins and ties him round her to keep him close. Then she and the other cavepeople have a feast to celebrate the baby’s arrival. Her friend clears up the cave and all is well. …Well, it might have happened. *Five minutes on the internet. Gaskin, I.M. (2002). Spiritual Midwifery. Summertown: Book Publishing Company. Gaskin, I.M. (2003). Ina May’s Guide to Childbirth. New York: Bantam Dell. Anything by Sheila Kitzinger: birth expert and anthropologist. Wiessinger, D. West, D. and Pitman, T. (2010). The Womanly Art of Breastfeeding. New York: The Random House. According to this infographic, the story above is a ‘paleofantasy‘ – cool! Chimpanzee giving birth in a zoo (YouTube). How does Ms Cavewoman’s birth strike you? Are there any elements of her birth that you’d like for yourself? Please let me know in the comments below. 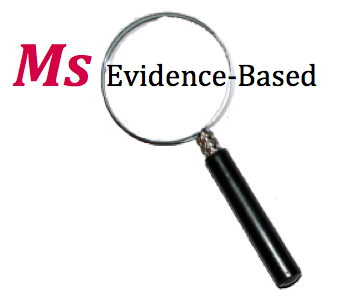 Ms Evidence-Based is a stickler for facts. She’s not going to make her birth choices based on what she’s read in the latest celebrity magazine. Oh no! She wants it backed up by cold, hard science. Ms Evidence-Based is 26, as that’s the age most people would recommend as the ‘best’ for giving birth. It’s her second baby, and she doesn’t have any other medical conditions or ‘risk’ factors. Ms Evidence-Based decides to give birth at home. This is because as it’s her second child, the Birthplace study says she can expect the best outcome for her and the baby’s health by avoiding hospital. She has a Midwife with her, as having a skilled attendant helps to mitigate against maternal and infant death. Ms Evidence-Based has antenatal health check-ups. She uses a birth pool for some of her labour, as immersion in warm water will reduce the likelihood of her requesting to transfer to hospital to have an epidural (she wants to avoid an epidural as having this intervention will increase her chances of an instrumental delivery). As well as her husband and Midwife, Ms Evidence-Based has hired a Doula, as continuous, emotional support from a non-family member improves her likelihood of having a birth without interventions. It will also make her labour shorter! Ms Evidence-Based requests that once the baby is born, the baby’s cord is not clamped so that as much blood as possible can pass between the placenta and the baby. Once baby ‘Samantha’ has arrived, Ms Evidence-Based breastfeeds her. She’s in frequent contact with breastfeeding support groups as she knows that regular support (especially face-to-face) will increase her chances of being able to feed for longer. She continues to have her Doula visit for a few weeks post-natally, as feeling supported may reduce her risk of developing Post Natal Depression. And the Doula can bring chocolate. Which is just good. Continuous emotional support in labour (and beyond) – Evidence Based Birth’s summary; Doula UK reference page; Klaus, M. Kennell, J. and Klaus, P. (2012). The Doula Book. Boston: De Capo Press. This article was published on the 31st May, 2013. Did you find looking at medical evidence useful in pregnancy? Or is it a distraction? Please let me know in the comments below. Last week, I wrote about Ms Average – a woman who takes the most popular choices for giving birth. But what if you don’t want to make any choices? What happens if you take the standard, default offering with no customisation to suit your own needs and preferences? In the UK, all maternity providers are meant to observe the NICE (National Institute for Health and Care Evidence) guidelines. There are different standards for different scenarios – antenatal checks, caesarean birth, low-risk labour and so on. In addition, hospitals and NHS Trusts may have their own policies or protocols for labour. And Midwives have to abide by their own professional codes. So there are a lot of regulations and rules flying around. In some ways, it makes sense. In the absence of anyone (cough cough, you) suggesting otherwise, there’s a baseline set of standards to start from. This means that if you have a change of shift halfway through labour, or move house during your pregnancy, you should receive a similar type of care. Even if you don’t live in the UK, your care providers will probably have a standard template that they will follow as a default option for birth. It’s worth finding out what their particular ‘map’ is. To make things easier, I’m going to assume that Ms Standard is giving birth in a hospital which follows the NICE guidelines to the letter and doesn’t have its own policies on top. I’ve also assumed that she’s not going to choose an Epidural, or have any complications during her birth. Ms Standard is a ‘low-risk’ mother having her second baby. She goes into labour naturally. Her waters haven’t broken when she arrives at the hospital. She’s brought her husband, Mr Nice, along. She’s met with a smile by the Healthcare Professional (HCP) looking after her. The HCP (usually a Midwife) checks her temperature, blood pressure, pulse; asks for a wee sample and feels her belly. The Midwife also asks her about any vaginal discharges or whether her waters have broken. She then listens to the baby’s heart for one minute. A vaginal examination is offered. They discuss options for pain relief. The option for labouring in water should be available. ‘Gas and air’ should be available for pain relief. Pain-relief drugs given by injection (e.g. Pethidine) should be available, but Ms Standard won’t be able to use a birth pool for two hours if she has one of these injections. Ms Standard’s labour isn’t considered ‘established’ until she is having ‘painful’ contractions and her cervix is 4cm dilated. If she comes to the hospital early, she may well be asked to go home. Once ‘established’, she is expected to make it to 6cm within two hours and continue to dilate another 2cm every two hours. Once her labour has got going, she has at least one professional ‘supportive’ person with her at all times (this is usually a Midwife, but the NICE guidelines don’t name the profession of the ‘supportive’ person. I’m going to assume it’s a Midwife for this piece). Ms Standard will be in a labour room on the labour ward. The Midwife will start her medical labour written records. Ms Standard will have her blood pressure checked every 4 hours. She’ll also be offered vaginal examinations at the same interval. Her pulse will be taken hourly. The baby’s heartbeat will be checked every 15 minutes, for one minute. Ms Standard will be asked about her pain relief requirements every so often. Once Ms Standard starts to feel the urge to push, she’ll be expected to birth her baby within two hours. However, if the baby hasn’t been born within an hour, then Ms Standard will be referred to an Obstetrician for possible instrumental assistance. As the birth is nearer, vaginal examinations will now be offered every hour. Her blood pressure and pulse will also be checked at the same frequency. The baby’s heartbeat will be checked for one minute, every five minutes. Ms Standard will be encouraged to find a position to give birth that isn’t lying down. Once the baby is born, Ms Standard will have an injection to make the placenta come more quickly. The cord will be clamped very quickly and the Midwife may pull on it slightly to help it release. It will be expected within 30 minutes. The baby will have a breathing and condition check when s/he is one minute and five minutes old. This is known as an ‘Apgar’ test. The Baby will be dried off and placed on Ms Standard’s chest, with a towel over them both to keep them warm. Baby Standard (‘Boris’) will stay on Ms Standard’s chest for an hour, after which he will be weighed and measured. The Midwives will support Ms Standard to start breastfeeding Boris within the first hour of his life. After Boris is weighed and measured, he’ll then have a further check which will look for physical abnormalities. The Midwife will continue to check Ms Standard’s pulse and blood pressure, and make sure that she can have a wee. She will check to see if there was any tearing, and make arrangements for stitching as necessary. Ms Standard may need to lie down with her legs in the air for the checking or stitching to take place. If any tearing is found, a rectal examination may be offered. Medication may also be offered rectally to reduce swelling. As it’s her second baby, Ms Standard will either go home after six hours or one night, depending on the hospital’s discharge policy. I’m aware that NICE is reviewing the guideline for the default option for managing the placenta after the baby is born. The information above is my understanding of what is in force at the time of publication (24th May 2013). I’m not a Midwife or Healthcare Professional. If you are and I’ve misunderstood something, please correct me below! 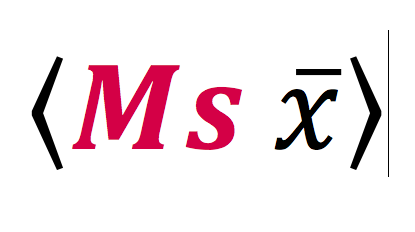 Is Ms Standard’s birth the one you’d want? Would you change anything on the list above? Please tell me more by leaving a comment below. Of course not! You are Ms (or Mr) Extraordinarily Fabulous. I know this, because you are reading my blog. However, I’ve been having a dig around at some statistics to see if I can create a profile for the ‘average’ woman giving birth in the UK. She’s 30, having her second child, and earns £26,500. Her baby will be born at 39 weeks and 6 days. Labour will last seven and a half hours. Ms Average’s first name is Elizabeth. When she found out she was pregnant, she went to see her Doctor but all her care after that was with NHS Midwives. Elizabeth had the standard scans and blood tests offered by the NHS to check the baby’s growth and screen for abnormalities. She’s decided to give birth in hospital. She won’t have met the Midwife who’s with her in labour before she has the baby. Her labour will start naturally (although one of her four other pregnant friends will have been induced). Elizabeth will use gas and air at some point in her labour for pain relief. She’ll also try breathing exercises. She has around a one in three likelihood of having an epidural or using Pethidine (pain-relief injection). She has a one in four chance of having a caesarean section. Her partner will be with her during labour. She’ll give birth vaginally, lying down in bed. Her baby will weigh 7 1/2 lbs. Elizabeth wants to breastfeed Harry, and she’ll start off doing so. However, by the time of her six-week check up, she’ll have switched to artificial milk (formula). Overall, she’ll be quite pleased with her pregnancy and birth experience. Her favourite chocolate bar is Cadbury’s Dairy Milk. Were you surprised by anything on this list? What do you think of this depiction of an ‘average’ UK birth? Please let me know by leaving a comment in the box at the bottom of this post! UK’s most popular chocolate bar – MoneySavingExpert and Daily Telegraph reports. Anyone who disagrees with the chocolate survey results is requested to forward rival samples to me for further in-depth analysis. Four and a half words. Four and a half little, tiny words that can make a big difference to how you feel about your birth. “They won’t let me!” Something you’ve probably said at least once in the last nine months. It’s a phrase which puts a little chill in my heart, and starts enormous alarm bells ringing in my head. And I think if you’re saying it a lot, you’re not going to have a happy time. Who or what is the ‘they’ in your mind when you say this phrase? A secret, hidden pregnancy mafia out to get you if you do something ‘wrong’? Your Doctor? Every Doctor? All hospitals in the country? The NHS? ‘They’ makes it sound like ‘them and us’. Like a war where you are fighting a load of enemy combatants (whilst desperately seeking people who are on your side). It’s a nameless group of people, and like the weird shadowy figures in nightmares – those figures are to be feared. So name the person or thing causing your trouble. It will bring you more clarity about where the problem lies. The clarity should reduce your fear – and point you in the direction of people who can help. ‘Won’t let’ sounds like you need permission. It also tells me that maybe you don’t have enough information about what your healthcare provider is recommending. In the worse case, it suggests a healthcare provider who is patronising you and acting as though you are a child. What do you really mean by ‘won’t let’? That something is not recommended? That something’s illegal? That something is being held back from you with no justification? Name it. Work out what’s behind the statement. Are you afraid of digging deeper? Take notice of that feeling: it’s telling you something important. You! Wonderful, lovely you. The phrase is all about how you are feeling. Frightened? Frustrated? Disempowered? What’s really going on when you say someone ‘won’t let you’ do something? How do you feel? OK, this is a bit of tough love – but the whole phrase? It makes you sound like a child. Not in an ‘oh she’s four and look how cute‘ way. But in the way which conforms to Eric Berne‘s theories of how we communicate. Berne thinks that there are three types of communication personality which humans (of all ages) have. He names them ‘parent’, ‘child’ and ‘adult’. In all the forms of communication apart from ‘adult to adult’, the power balance is off in the conversation. In an ‘adult to adult’ conversation, you are equal with the person you are talking with. In a ‘child to parent’ conversation, you are giving the other person your power and assuming that somehow their role is to ‘look after’ or ‘be in charge’ of you. ‘They won’t let me’ is not a phrase said by a person who is in control and content with the situation. It’s said by someone who’s frustrated by their lack of autonomy. 1) Sound the alarm bell. Every time you hear yourself thinking or saying the phrase, “They won’t let me…” – STOP! 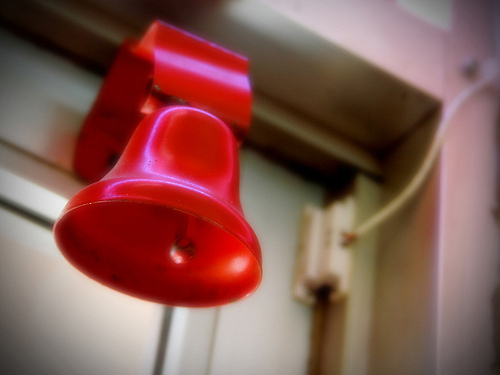 Put a picture of a big alarm bell in your mind and congratulate yourself for noticing. 2) Replace words and work out what’s really behind the message. I didn’t know why he was suggesting this in my circumstances and I feel a bit confused. I’d like to talk to a home birth expert to see if I have any other options. 3) Take action to make it happen! If swapping the words round meant you identified what you really want to happen with your birth choices, the next step is to …make it happen! Can you contact a Supervisor of Midwives to change or explain a policy? Hire a Doula to be your advocate? Find a local support group for women with a similar medical or birth history? Come to terms with whatever the situation is, and accept it? Being in charge of your own birth-related decision-making will feel so much better than someone else making choices you don’t want on your behalf. 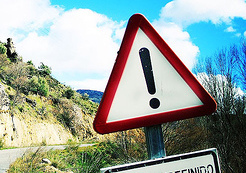 Get that warning bell at the ready and ask for clarification until you are comfortable. I would write more on this, but, y’know… it’s late, and they won’t let me. When was the last time you thought ‘they won’t let me’? Did changing the words using the suggestions above help? Please let me know what you discovered by leaving a comment below. PS I hope this is obvious, but I’m not suggesting that you ignore the advice of your healthcare providers… just that you are clear in your understanding of the reasons behind what they are suggesting. Frustration-free birthing FTW! Thanks to openDemocracy and seanmcmenemy for the pictures. I shed a little tear at work today. Not just because I was looking at a rather dull spreadsheet when it was sunny outside. But because whilst I was wrestling with said spreadsheet, I was also listening to a story of the line between birth, life and death. 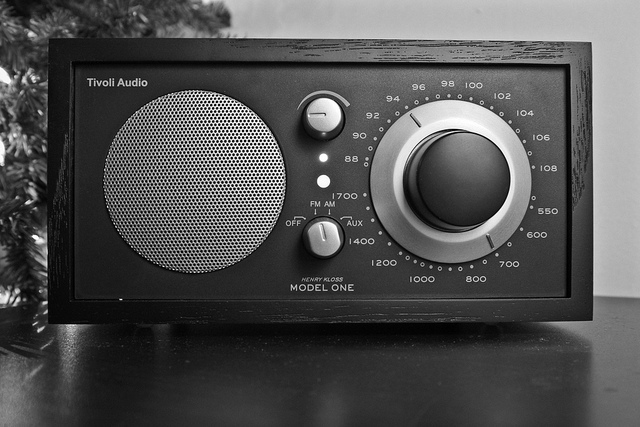 I’ve mentioned before that as well as being a birth geek, I also have another love – radio. RadioLab is a podcast which is also broadcast on NPR – America’s equivalent of BBC Radio. RadioLab’s way of making audio is unlike anything you’ve heard before. The best way I can describe it is like the audio version of a TED infographic. They weave different voices and reactions together to tell a story that’s like an audio cartoon. It doesn’t always work (sometimes I find myself getting confused about who is who if there are many speakers involved in the telling). However, they are not afraid to interrogate a topic and the inclusion of the asides from a contributor that would normally get left out leave audio offerings that are addictive to the ears. The episode I’m about to wax lyrical to you about? April 30th, 2013‘s. The story of a couple who had a baby born at 23 weeks, and 6 days. I’ve often thought that you can tell a lot about how someone thinks about birth, by how they feel about death. The two events are flip sides of the same coin. An ending, a beginning. Something people are frightened of, or trust completely. An inevitable next step in the onwards march of evolution, or a continuation of the Circle of Life (complete with Simba and a Lion’s head in the clouds). You know, all of that ‘deep’ stuff. Whatever your take on all the ‘deep’ stuff, the life/death line is pretty compelling. Hear people talking about it with raw honesty and it’s like a magnet attached to your ears. Your brain is going to crackle as you focus in on hearing stories that sit right at the heart of the meaning of why we’re here. Kelley and Tom had tried for a baby and ended up having IVF with the assistance of an egg donor. Unfortunately, the baby started trying to be born early. After being in hospital for a while, eventually Kelley ended up having her daughter at 23 weeks, and 6 days. This raised all sorts of questions. In America, 24 weeks is seen as a ‘cut off’ for a baby having a chance of making it. The podcast looks into the history of this decision and examines how technology has changed since the issues were first examined in the 1970s. Kelley and Tom had to decide whether to allow their baby to die gently in their arms, or if they should try to use medicine to intervene to save her. They describe the agonising night when they were deciding whether to say ‘yes’ or ‘no’ to authorising an attempt to revive her. It’s like a world of philosophical debate is being channelled through one set of parents in the space of a few sleepless hours. The next section examines the significance of a baby’s grip on a finger. Is it the child’s determination to live shining through? Or just a reflex, biological action? We hear from a NICU (Neonatal Intensive Care Unit) Director with his own perspective – there’s a twist in his tale. You’ll have to listen to find out why it wasn’t the other way around. NICU Nurses tell of their experiences of watching babies who get sick, and caring for the ones that don’t make it. Kelley talks about the disorientation of being in the cheerful surroundings of a Maternity unit one day, and the despair of NICU a few days later. The floors between the two areas of the hospital are a symbol for two different worlds. Tom decides to start reading his daughter Harry Potter as a way to keep connected. She appears to like it – but is that biology again? says Tom, as he explains why he found reading to his daughter so helpful. The Nurses come back again to explain that Western society is just not very good at coping with the death of babies, any more. The rest of the world is still used to it, they say. It doesn’t make it fair. Our Grandparents were also born in a time where not all the children would survive. But technology has moved on for those in rich countries – and we aren’t sure how to manage when it fails us. From a radio point of view, the credits are done in an interesting way. But that’s not what you want to know, is it? All I’ll say is that if you have not cried during the rest of the programme, you will during the last ten minutes. It’s powerful stuff. But then, isn’t life itself? You can hear RadioLab’s ‘23 Weeks 6 Days‘ on the RadioLab website, where it is also available to download. It’s a rewarding, if challenging listen. Congratulations to the programme team for making it and thank you to Kelley, Tom and the other contributors for sharing their story with such raw honesty. Warning: The programme is a truly awesome (in the correct sense) listen, but it contains strong themes. It covers IVF, abortion, miscarriage, neonatal death, prematurity, babies in Special Care/NICU, babies needing operations and related issues. You may wish to consider this before choosing to listen. If any of these are triggers for you, please see the ‘Help!‘ page. If you liked the programme, please share this post with others so they can hear it, too. Disclosure: I have no connections with RadioLab other than hearing them speak at an industry conference once, and liking the podcasts that they produce. What kind of birther are you? Hairy Hippy? Earth Mother? Trouble-maker? Worried patient? a) Agree immediately – after all, the medical staff know what they are doing! Mostly As, Bs, Cs or Ds, or a mixture? We’re all different. We all have different hopes, wishes, fears and ways of dealing with the world. There’s no ‘right’ way to birth. If you choose to have a Doula to be part of your birth story, then you’ll find she is supportive and non-judgemental. She won’t mind about what choices you make, so long as she knows you are happy and confident in those decisions. You are far too extraordinary to be defined by a little box. Having said that, I’m the kind of person that likes to question and probe. So here’s the challenge: Do the quiz again, but select different answers. What might it feel like to be that person, and make those birth choices? What might the consequences be? How does that feel? What did you discover? Please let me know by leaving a comment below. I’d love to hear what you found out.